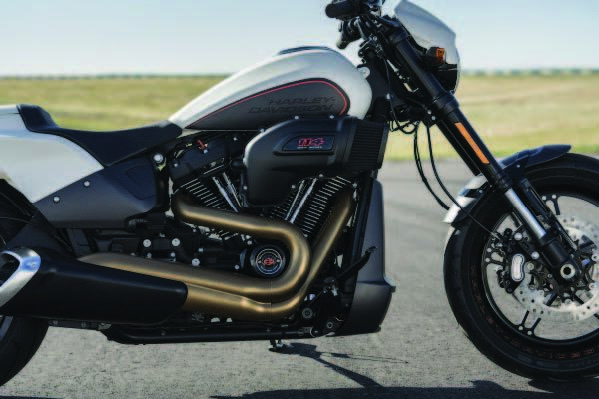 I saw imagery of the new FXDR before it was announced to the world (it was a top-secret drag racing inspired Softail) but I held my tongue and I’m glad I did. There seems to be a trend of riders wanting to provide feedback on a product they have never used, based purely on images or what the current trend is. I have been guilty of this numero us times and I know now that my initial impression of something can be wrong. That isn’t to say that I am wrong to have an opinion but just that I should keep it to myself until I can actually test it. 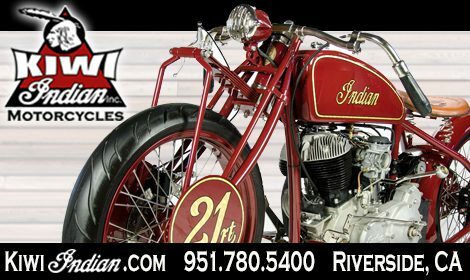 H a r l e y – Davidson has a long history in drag racing, going back to the 1920’s when they set several speed trial records on Daytona Beach. They’ve continued that through the modern era with NHRA races all over the country, even producing a purpose-built drag strip only V-Rod Destroyer. The FXDR is not a derivative of the now extinct V-Rod nor does it pay homage to the record-setting Daytona racers of the 1920’s. It stands all on its own, stout and mean. 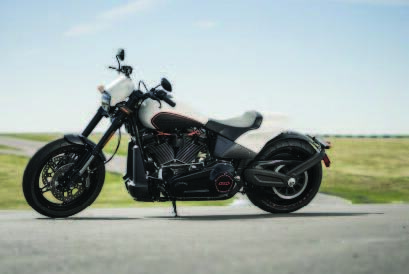 As I began to get familiar with the FXDR, it became apparent that with just a slight fl ick of the wrist the 114-inch motor would propel me forward, violently. With a claimed 119 footpounds of torque, I learned that in town throttle had to be used judiciously, but the power was there if needed. 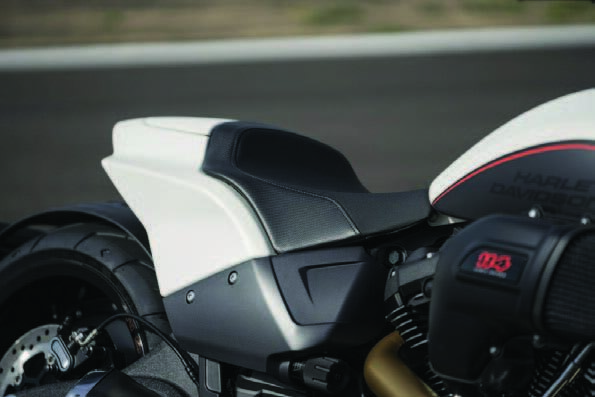 The seating position has the traditional forward controls with a moderate scoop in the solo seat to keep the rider from sliding back, proving useful as we opened up the throttle, weaving through Milwaukee traffi c during the 115th anniversary. As I threw the 240 rear tire (yes you read that right 240), I noticed there was little chance of scraping due to the over 32° extreme lean angle available on either side. The hand tuneable rear shock, standard on all Softail models, provided ample cushion and performance in the pothole – r iddled streets of Brew Town. The 240 rear tire gives pause to riders who were around for the big tire craze when everyone slapped a big tire on the back and called it good. Those days are gone, and Harley proved it with the Breakout, also sporting the same 240/18 rear. If set up properly the 240 can handle well, and you can be sure that the drag racing inspired FXDR 114 Softail is set up PROPER. The long and low frame is lightened through use of an aluminum swingarm and subframe weighing in at 668 lbs, a mere 4 lbs less than the Breakout and 175 lbs heavier than the Ducati Diavel. I know it isn’t apples to apples comparing a Harley to a Ducati, but they have similar styling cues. 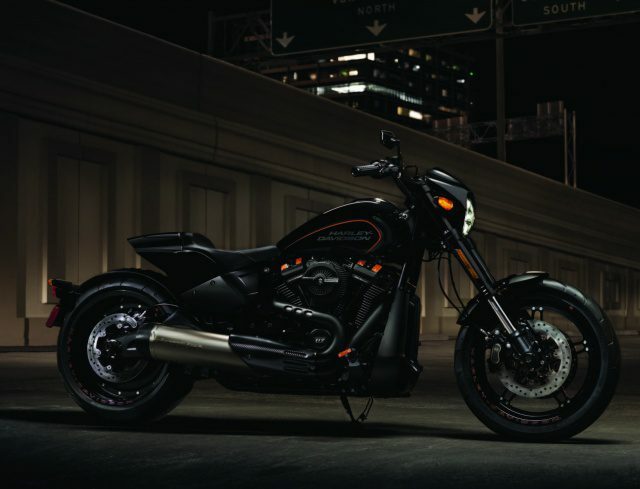 I sense that a rider who might have been interested in the V-Rod or wants a Harley that is more “sport” oriented than the Breakout would be the customer for this bike. The FXDR 114 is long and has a ton of rake at 34 degrees with 4.7 inches of trail that is provided by de-rake in the triple trees. If you aren’t sure what rake and trail mean, Google “rake and trail explained.” Both of these numbers seem high for a sportoriented cruiser and are similar once again to the V-Rod but with less trail, meaning that this bike will corner better. The question I was asked soon as I stepped off the bike anywhere in Milwaukee was “How does it ride or How do you like it?” I reserved my judgment until I put a days’ worth of seat time on it. Then I could confi dently say that it corners well, not just for a bike with a 240 tire, but it corners well…period. The clearance and lean angle add to the confi dence inspiring but somewhat stiff rear suspension that is coupled with a race inspired but non-tuneable inverted 43mm front suspension. 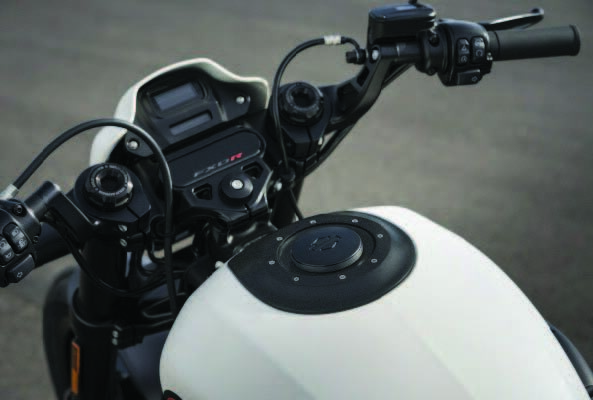 The clip-on bars are not what you typically see on a café type bike, they’re beefy, just like the rest of the bike. There are a few parts of this bike from an aesthetic point of view that, if I want to be considered a journalist, have to be addressed. One is the large and angular exhaust. Easily replaced with a Screaming Eagle carbon and titanium collector that I understand will be available from Harley P&A shortly. The air box is giant but has a purpose in feeding the giant 114- inch motor, but could also be easily replaced by a smaller one. Those are easy fi xes and can be seen on the picture of the black FXDR 114, that has been accessorized. My preconceptions of what this bike might be were utterly wrong. 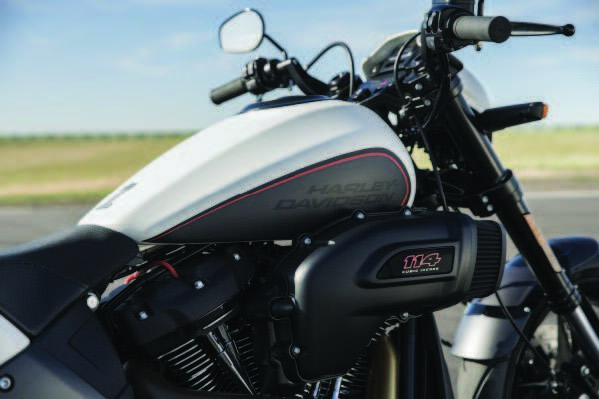 Although there have been several upgrades to other models for 2019, the FXDR 114 is the only NEW model. It is a departure from previous Harley-Davidson models and after having spent signifi cant time with the FXDR 114, it taught me that although I may have opinions, nothing is more important or convincing than some time in the seat. 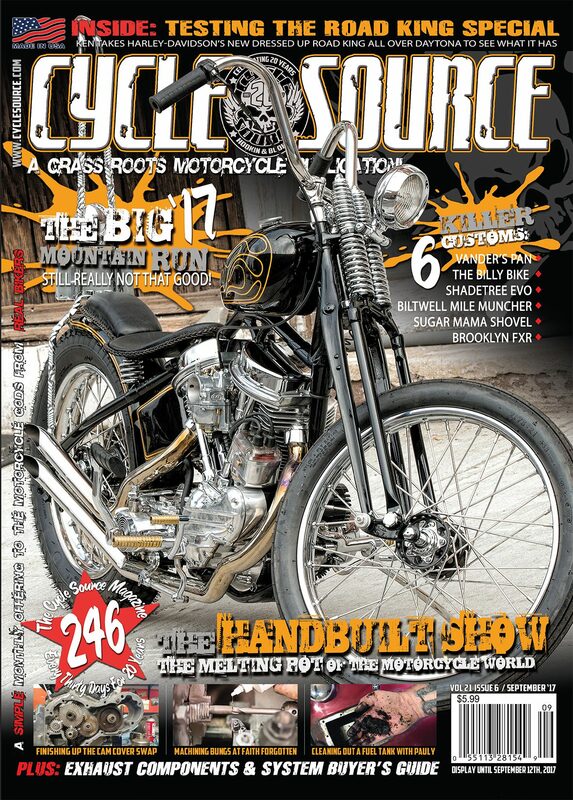 This entry was posted in First Rides and tagged Back Issue, Cycle Source, Cycle Source Magazine, First ride, FXDR, FXDR 114, Harley, Harley-Davidson, New Product, November 2018. Bookmark the permalink.